Harry with Sabrina. Harry appears to be working on a shoe. 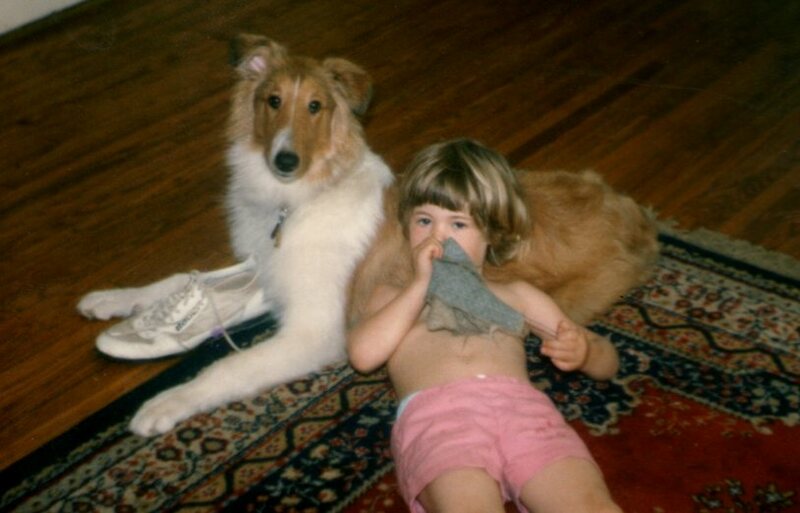 In the dead of the winter of ‘86, when my twins were one and Brina four and a half, my ex and I decided that what we really needed was a puppy. And not just any puppy. A Scotch collie puppy. This was because my ex’s thesis supervisor had owned a succession of Scotch collies and imitating him in every respect seemed to my ex a prudent course. Accordingly, one cold and snowy night we wedged the diapered duo into their car seats, sandwiched Brina in between, and slip-slided our way down the 402 to a farm outside of Sarnia. There, in a barn, we found a rattled looking mother collie and her litter, asleep in the hay, and returned to London with Harry zipped inside my coat. It is hard to house train a puppy in the winter. It is even harder to house train a puppy in a house with no door opening onto a fenced in yard. It is harder still to house train a puppy with perambulating one year olds whom you dare not leave alone while you are escorting the puppy outdoors lest they fatally injure themselves or their twin. Because Alice and Will fought from the moment they achieved sufficient muscle tone to deliver a reasonable facsimile of a wallop and didn’t stop until they were teenagers, when they went all twin-y. Looking back on it, I must have left them alone the occasional time, figuring that screams would alert me to any true danger. Perhaps I instructed Sabrina to look after them, knowing full well that she was still on the fence as to whether we should keep them. Collies are herding dogs, which worked because my kids were a wayward flock, always trying to scatter or make a break for it. Collies are also watch dogs. If a leaf fell in the front yard, Harry barked. If a car drove by, Harry barked. If, God forbid, a person should walk down the sidewalk, Armageddon! Harry barked when he was awake and he barked when he was asleep and, if I had had a gun, that’s the way he might have gone down — barking. Only I didn’t, so he didn’t. One more argument for gun control. Harry liked to couple the pleasures of barking with lunging, usually at windows. He broke through the pane glass window in the front of the house on four separate occasions and was saved from hurtling to his death from an upstairs window by a astonishingly resilient screen. I would appear at the glass repair shop, carrying a window with a collie-shaped hole in it. Harry was famous at the glass shop. The first time my ex and I spent a night away from the children, we hired an older woman to babysit. When we returned home, the kids roasted the sitter. She was mean. She had thrown a book at Alice. She had locked Harry in the back room the entire time. I didn’t believe them. Then Harry, who was not a small dog, climbed onto my lap and leaned all of his weight against my chest, pinning me to the chair. He lifted his fabulous needle nose to the sky and began to keen. We never hired that sitter again. One Canada Day, Harry was listless. He lay on his side looking pooched. “That dog’s sick,” my neighbour said. “You’d better have him seen to.” It was a national holiday; the regular vet was closed. I took him to the emergency vet, who stuck his finger up his bum, announced, “This dog has gas,” gave me a bottle of Pepto Bismal and charged me $100. Another time, Harry swallowed a bouncy ball, which lodged in the opening between his stomach and his intestine. The operation to remove it cost $800. The vet let the children in to visit Harry, who was lying on the floor of the animal hospital with IV tubes coming out of him. They ran up to him, his flock of unruly sheep, and fell to their knees, embracing him and cooing. Harry’s tail thumped. “Operate,” I said. Harry contracted Lupus at age seven and died too soon. Writing about him, I remember him. Remembering him, I miss him. Harry was two good dogs ago, but I guess the pane glass window wasn’t the only thing Harry put a collie-shaped hole in. He put one in my heart.